Athletic shoes can have many names: tennis, basketball, walking, training, racing, and more made of different materials and different height soles. Some are high-top, ankle height, some with shoe laces and some with Velcro® closures. 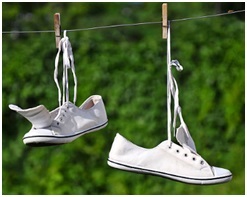 You want to know how to clean athletic shoes that can be done at home quickly and easily. Always follow the manufacturer’s instructions that come with your shoes. 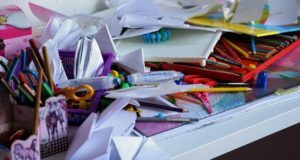 Most cannot be tossed into the washing machine and must be cleaned by hand. Some of the very casual canvas shoes for kids and adults can be put into a zippered mesh laundry bag or pillow case and be washed with detergent but no bleach on the gentle cycle using cold water. They can never go into the clothes dryer being air dried. How to Clean Sneakers EASY – Hacks for keeping shoes white video. First remove the shoe laces and insoles then brush off all loose dirt and particles on the surface and bottom soles. Use an old toothbrush or larger brush and briskly rub. Then put detergent with lukewarm water into the sink or small tub and brush the top and soles. If your shoes have stains after brushing off the dirt, sprinkle baking soda on them and brush into the spot letting the shoes sit overnight. Do the above method with detergent and let air dry. Do not get any leather or suede wet. Wash the laces and insoles separately the same way. Rinse well with cool water with a wet sponge. Do not let any detergent remain. Let your shoes airdry in the shower or outside. Do not put them into a hot dryer that can remove the glue and shrink the material. 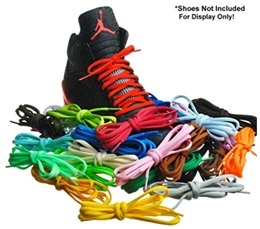 This might be a good time to buy new shoe laces if yours have become frayed and worn. They come in a million colors to mix or match with your shoe colors. Some are round, and some are flat available in different lengths for what your shoes need. Leather shoes are not only attractive, they fit your feet the best. However, maintenance is more difficult. 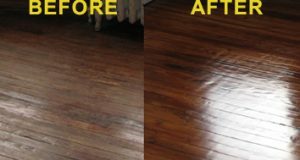 You can always contact the shoe manufacturer for how to clean your shoes or even take them to a shoe repair shop for the professional cleaning methods they use that are near perfect and not too costly. 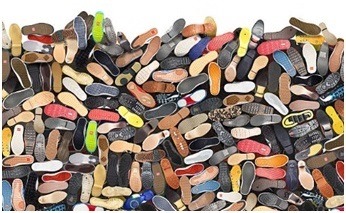 First remove the shoe laces and insoles then brush off all loose dirt and debris on the surface and bottom soles. 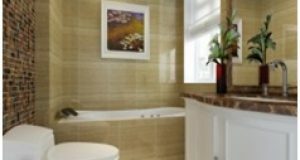 Use an old toothbrush or larger brush and briskly rub. Leather and suede require special treatment using a suede brush. If the manufacturer states you can put them into the washing machine, do so with a mesh laundry bag or pillow case. Do not put in the dryer. Put small towels or paper to maintain the shape of the shoes into the toes and airdry. For removing stains, use vinegar and water and wipe the stains letting the shoes sit for 24-hours. 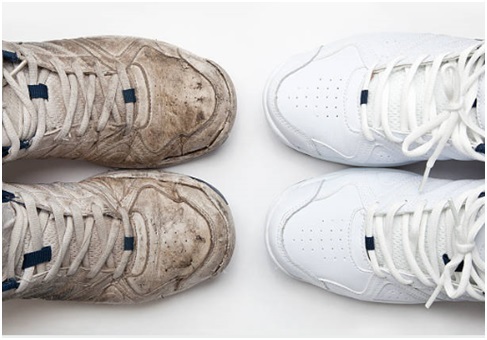 When you keep up with brushing off dirt and removing stains immediately, your cleaning athletic and sports shoes task will be easier to do, and your shoes will look great and feel good on your feet for many years. Feel welcome to leave a comment or ask a question below and I will reply to each message.